By: VeriSign Authentication Services, now a part of Symantec Corp.
As organizations implement EHRs-or as they ramp up their existing systems to make them more robust-concerns about patient privacy will move to the forefront. 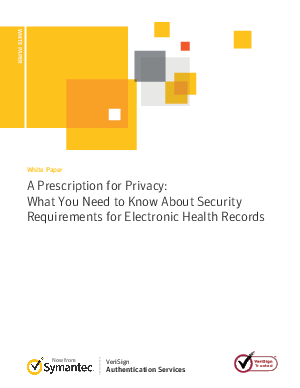 This report looks at the challenges surrounding the new world of EHR technology, including the requirements that govern protecting confidential patient data online, as well as security breaches and other risks that come with storing and accessing that information with web-based systems. The report also details the measures that organizations need to start taking right now to prepare for the upcoming changes in the healthcare industry.